Members elected from the county central committee. Every two years, county central committee members elect delegates from among the members of the county central committee who were elected by the public on an open ballot. 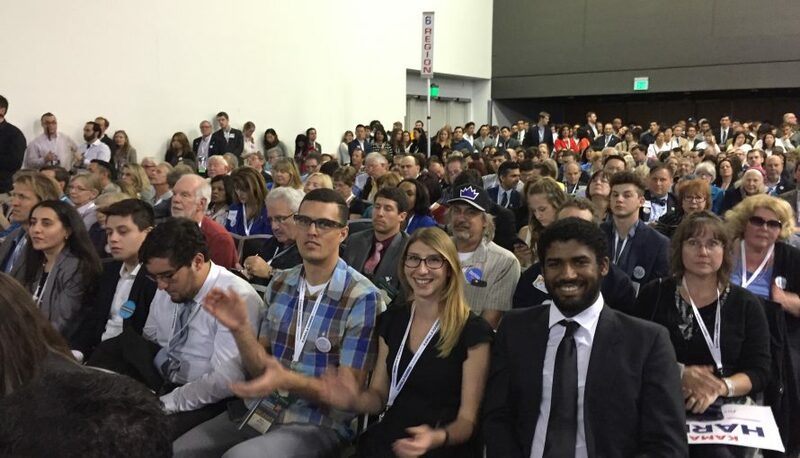 The number of delegates is designated by the California Democratic Party based on county voters. For Santa Barbara County in 2019 we got to elect 7 self-identified females, 7 other than self-identified females, and one executive board member. Each Assembly District elects ADEMS during caucuses held in January of odd-numbered years. Any registered Democrat in the district may vote in the caucus. Each district elects 7 self-identified females, 7 other than self-identified females, and one e-board member at the caucus. You must be a registered Democrat, apply, and pay a fee to run for this election. State and federal elected Officials and party leaders, as well as their appointees (or, in districts held by Republicans, the top Democratic vote earner in that district’s election.) The number of appointees depends on the type of legislator/district. Locally, State Assembly Member Monique Limon, State Senator Hannah Beth Jackson, and Congressman Salud Carbajal appoint. If people are interested in attending the convention but are not delegates, they may go as observers. There is a fee associated with that. For more information, please visit the CADEM convention website.